Delicious!! 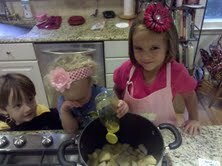 We finished dinner so early tonight that we decided to make some applesauce for dessert. I didn’t have enough apples to make a substantial quantity of applesauce so we added in a couple of delicious local pears. Peel and chop apples and pears. Put in large pot. Add honey. Heat and stir constantly. Break up the apples and pears as they get soft. Season with nutmeg and cinnamon. Add about 1/4 cup of water and bring to a boil. Continue cooking for about 1 minute. I used an immersion blender briefly – mainly because I couldn’t find my potato masher. I wouldn’t recommend the immersion blender. I finally busted out my trusty pastry blender – my go-to tool for so many cooking projects – and mashed the apples and pears until they were a kid friendly consistency. We served the warm applesauce over a little bit of ice cream and put the rest in a 16 ounce Ball jar to chill and enjoy later. Enjoy!